This week I’m starting a vignette titled Daughters of the King. This short story (it’s 7 pages long) was written by our editor Amy Menge and illustrated by the immensely talented Shazzbaa. For those of you who don’t know her, Shazzbaa is the creator of Today Nothing Happened and Runewriters. She’s a graduate of the Savannah College of Art and Design and an avid gamer. I was overjoyed that she was willing to do this project for me, and the results were everything I hoped for. Please enjoy our tale about love on the colonial frontier. 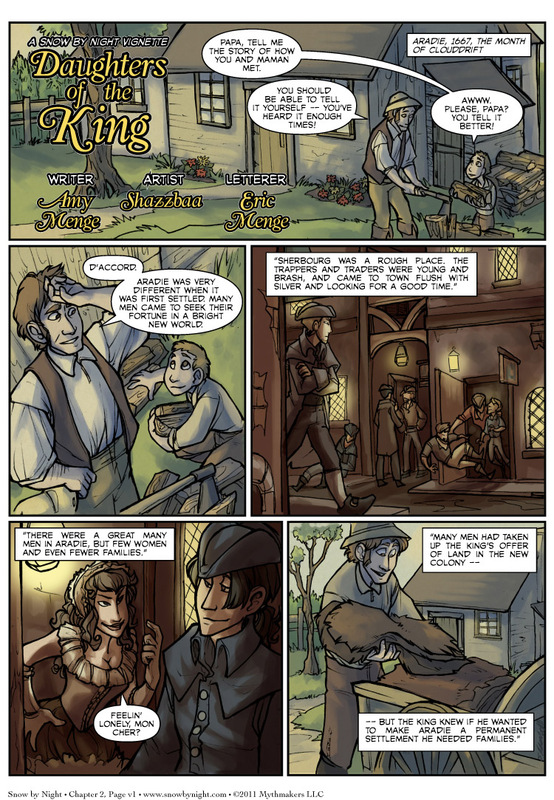 Oh, for the vote incentive, you can see the Daughter of the King herself. Vote for Snow by Night on TWC. Yay comments! I have to say that I absolutely love this comic. Especially it’s art. And very compelling characters. Thank you for making this. Awesome page….and I have to say I am diggin’ the new navigation button design!